PowerShell scripts offer a handy way to automate various chores. Working with these scripts effectively can be a difficult task. This comprehensive guide starts from scratch and covers advanced-level topics to make you a PowerShell expert. The first module, PowerShell Fundamentals, begins with new features, installing PowerShell on Linux, working with parameters and objects, and also how you can work with .NET classes from within PowerShell. In the next module, you'll see how to efficiently manage large amounts of data and interact with other services using PowerShell. You'll be able to make the most of PowerShell's powerful automation feature, where you will have different methods to parse and manipulate data, regular expressions, and WMI. After automation, you will enter the Extending PowerShell module, which covers topics such as asynchronous processing and, creating modules. The final step is to secure your PowerShell, so you will land in the last module, Securing and Debugging PowerShell, which covers PowerShell execution policies, error handling techniques, and testing. By the end of the book, you will be an expert in using the PowerShell language. If you are a system administrator who wants to become an expert in controlling and automating your Windows environment, then this book is for you. 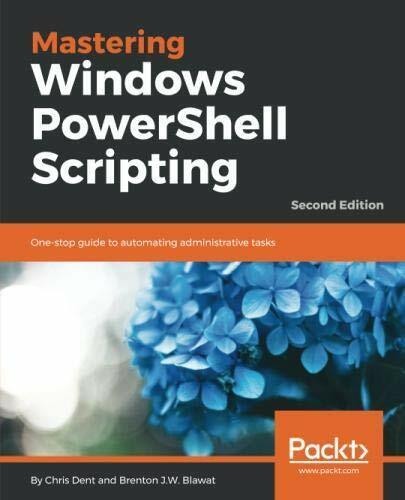 It is also for those new to the PowerShell language. If you have any questions about this product by Packt Publishing - ebooks Account, contact us by completing and submitting the form below. If you are looking for a specif part number, please include it with your message.